Space Elevator risked their lives in the name of art and music when they shot the latest cover for their single, I Will Find You, on the roof of the iconic Vanguard Building located on the A40. 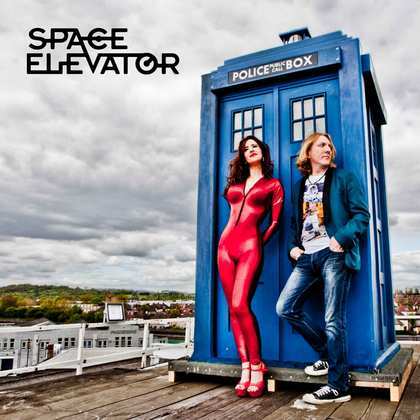 What prompted this was when the band’s lead singer, The Duchess, happened to be driving past the building when she noticed a fantastic Tardis on the roof and Space Elevator’s soon to be released single just so happened to be inspired by Doctor Who! No one had ever dared to do a photo shoot on the dangerous roof with no fencing to prevent an almighty fall onto the A40, but when you see the electric images produced you’ll understand why the band were determined to venture up there. The Vanguard people never let anyone on their roof but made an exception for Space Elevator as it was the building’s 50th anniversary so they viewed this as an exciting collaboration. The new single is released on Friday 26th June. Performing unforgettable songs with anthemic choruses, the band draw inspiration from the classics of the 70s and 80s, bringing the past to the present with a modern twist, creating their own unique and powerful sound. Space Elevator songs are all co-written by lead singer The Duchess and guitarist David Young. Watching The Duchess perform with such flamboyant energy and power, you know that you are in the presence of a real artist. Performing only in eye-catching cat suits uniquely designed for her, The Duchess quotes as her influences some of the greatest showmen and women in the history of rock - Freddie Mercury, Steven Tyler, Pink, Chrissie Hynde and Kate Bush. The Duchess presents a new kind of showwoman that the world has not yet seen. Not only is she a captivating performer, her vocal range is extraordinary both live and recorded as demonstrated in the new single “I Will Find You” (Gallifrey Dreams). The Duchess has been in love with the Doctor for as long as she can remember, so she has composed a passionate love song to him. He’s strong, intelligent and desirable to most women, yet he is unobtainable. He fights Daleks and Cybermen, and he is a man with two hearts but, as a Time Lord he could never belong to the Duchess. The electric guitar, drums and vocals powerfully combine to create a dramatic, explosive song of love and heartache. The song also speaks to anyone who has that one special person in their life who they have lost but will never forget – when you know you’re incompatible but you still desire that person and will always be thinking of them. A song for Doctor Who lovers and for anyone with a heart who has simply ever loved and lost.